That’s not some post-apocalyptic wasteland or a nightmare scenario come to life, that’s Australia. Specifically, it’s beautiful Sydney, Australia, circa yesterday. 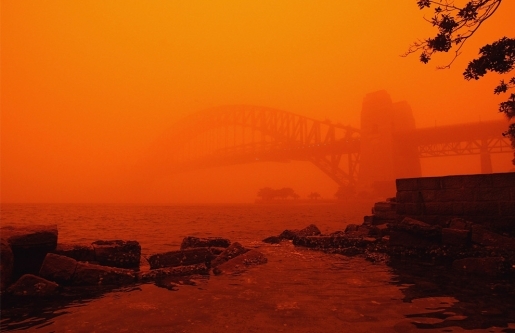 It’s hard to believe, but that harsh red sky is actually a signifier of a freakishly large dust storm that ravaged New South Wales and Queensland. While Australia is no stranger to dust storms sweeping in from the Outback, the unusually hot weather and a decades-long drought combined to produce a record-breaking storm the likes of which hasn’t been seen in the Land Down Under since 1942. You can see the effects of the storm in a great photo gallery, complete with some before-and-after shots. It’s like a totally different world, isn’t it? Looking at those images, you’d think the storm was fierce enough to have cost lives, but remarkably, no one was seriously hurt. There’s a lot of dust to sweep up, with millions of dollars in damage and lost work time to go with it, but it should have been a lot worse given the storm was over 930 miles long!